We dropped by a small house museum called the Museum of American Heritage (MOAH) on the way to Stanford University. I wasn't sure what to expect but it turned out pretty good. A pinball exhibition was ongoing when we were there so that was fun to play with. And there were many interesting old gadgets. A volunteer named Jim was guiding us throughout the visit. 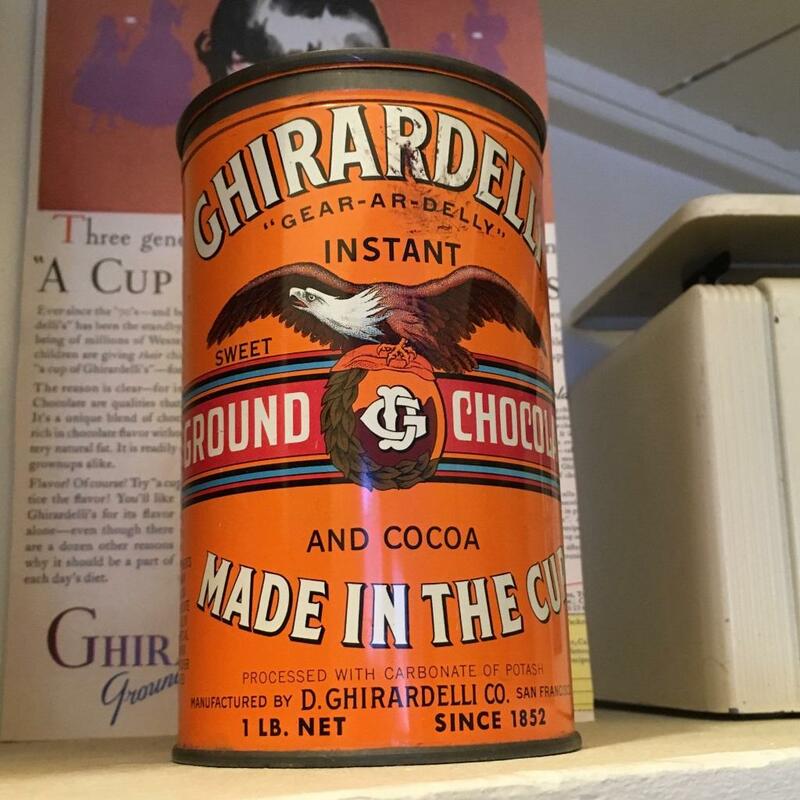 An old can of Ghirardelli chocolate. So now you know how to read "gear-ar-delly"! Ever wondered why pinball is named so? Well, when they first made it, it was literally a bunch of pins and a ball, no flappers or anything else. Hence the name "pinball". The earlier machines didn't require too much skill. Here's a good old pin-ball machine. You can play a game of poker with this machine with this particular variant. 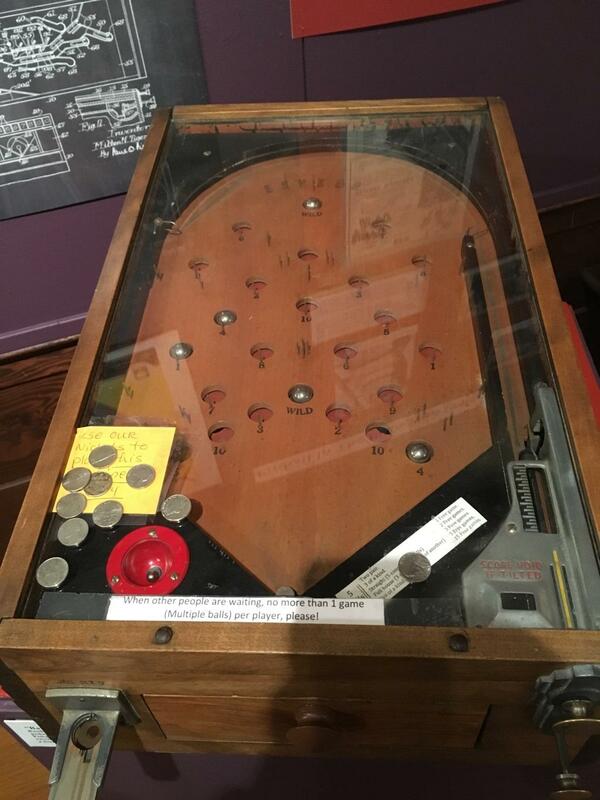 This is the most advanced mechanical pinball machine before electric components were introduced. When a ball reaches the "out" hole, all the balls in the middle gets flushed, and the out counter goes up. When the out counter reaches 3, it flushes all balls in the field. When a ball makes it to the "hit" section, the entire plate rotates. Unlike all other mechanical pinball machines, this one was actually pretty fun to play. This is an electrical pinball machine. It features bright lights and electrically operated bumpers that bounces the ball around. The bumpers make a nice "cha-ching" when a ball hits them. This is the backglass art of the same pinball machine above. Jim the volunteer told us is that quite a few pinball machines had nice backglass arts that expressed many progressive social ideas for the time, like female astronauts. Supposedly, those backglasses are more valuable than the pinball machines themselves. The Intertype typesetting machine blew my mind. According to Jim the volunteer, arranging the physical types for a page of newspaper used to take a full week. Naturally, newspapers used to be published only weekly. The Intertype machine made typesetting dramatically faster. At the backside of the machine, there is a cylinder of molten lead. As you type on the machine, the moulds for the letters you type fall into the tray in front of you. Then as you "flush" the current line, the molten lead is cast into types that you can use to publish newspapers faster than ever. This machine helped the invention of daily newspapers. The machine was very expensive so people came up with various ways to keep it busy 24/7. One such way was to typeset a national newspaper earlier in the day, then to typeset a local newspaper later in the day (I think this is kind of similar to how earlier computers were all time-sharing systems; Computers were very expensive and valuable back then). Unfortunately, I didn't really get to see it running live. They stopped running it live after many parents expressed concerns about their kids (at the museum) being exposed to lead fumes and all. I was visiting San Francisco from June 1 to 7. Here are some pictures I took. A street in the Mission District. Street arts are not hard to find and houses are painted with much brighter colours. It's nice and warm when the sun is up but it gets really cold as soon as you are in the shade. Ocean wind, I guess. In general, you need to wear a t-shirt and carry a thick sweater to wear in case it gets cold. The view from the parking lot of the San Francisco General Hospital. You can see the fog looming afar. I liked seeing many old 80's cars in SF. The city is also incredibly hilly. It's hard to capture the steepness in a photo. There were many tasty mexican joints as well. A lot more common than the Chinese restaurants in Toronto. Tacos from El Farolito. It was good.